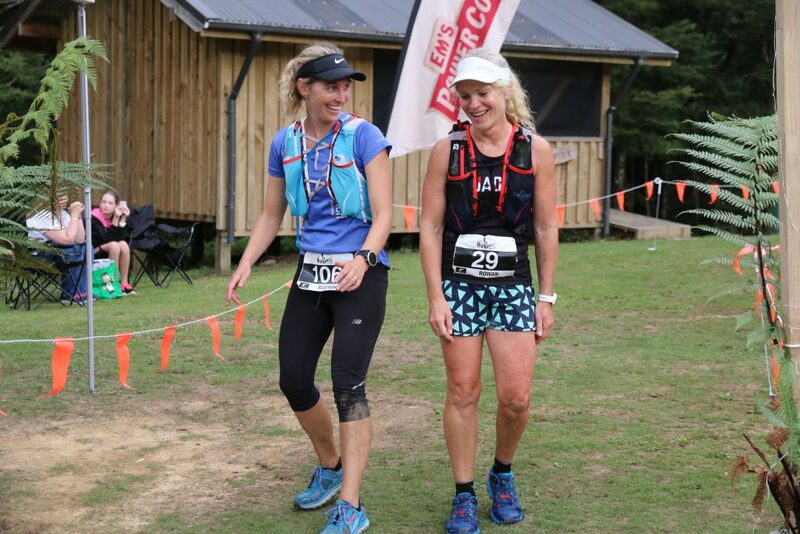 My journey to the Old Ghost Ultra started with my good friend and running buddy, Nicki, telling me that she was signing up for the event. I had no plan in my foreseeable future to run that far, but I thought “I can’t let her do it without me!”. I also thought that if I was ever going to do it, it would be way be way better doing it with a training mate. The day before entries opened, I won an entry through Squadrun by committing to fundraising for the Mokihinui-Lyell Backcountry Trust – the guys who built and maintain the Old Ghost Road track. The next day, Nicki entered the race too and we were very excited! Six months or so of training together and weekend adventures! Not too long after this, Nicki unfortunately got a bad knee injury. I really hoped it would come right quickly and we could get back to the plan, but it was not to be. She eventually accepted the fact that the 2018 event was not going to happen for her, and I accepted that I would be doing a fair whack of training on my own. After all, I had committed to the fundraising and had bought a Squadrun training plan – there was no going back now! Training ticked along okay. My optimistic side thought that I would learn to love getting up for early morning runs. I didn’t. I thought I might adjust to running in the heat. I didn’t. Gisborne summers often have days around 28-33 degrees C, and that mixed with having my three kids home because of the summer holidays made training testing. I was worried that I wasn’t doing enough, but I was averaging about 3-4 runs per week from my plan. My first extra big training run was on my 36th birthday in December. I got up early, set up an aid station at my mailbox and headed down the road to the local DOC track at the end – Te Kuri Walkway. One loop of the off-road farm track plus the run up my road and back to the mailbox was 8.3km and around 350m elevation gain. I ran it five times to make it a marathon distance, 42.2km with over 1700m of elevation. Not quite the epic adventure I’d imagined I’d be having for my training but it was good to have under my belt and to test food, hydration and gear. Plus the views up there are spectacular! 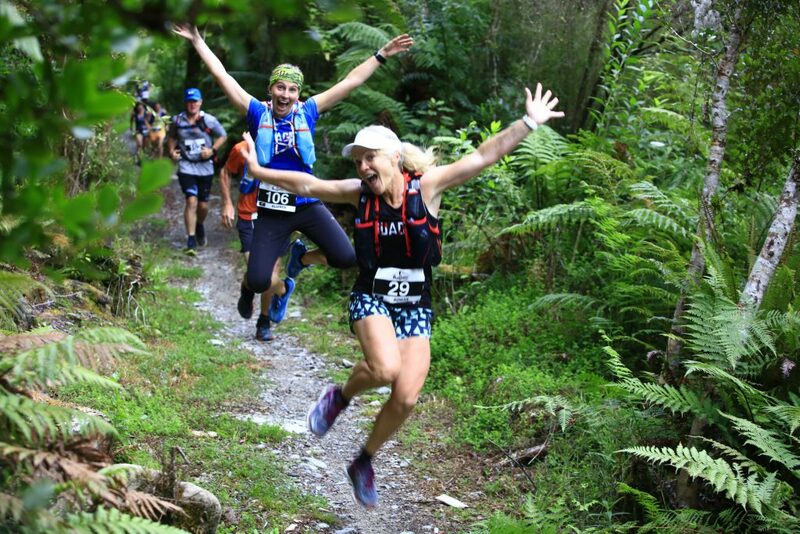 I did manage some stunning trail runs over the summer, notably the Pakihi Track and Whinray Reserve in Motu, Puketi Kauri Forest in Northland and my last Super Sunday – a 50km muddy run around Lake Waikaremoana with my husband Joss and our mate Doug Moore who was about to head over to the Hong Kong UltraTrail 100km. During all this I was thinking of how I could get some fundraising done. The president of my local Harriers Club suggested an Old Ghost Halloween Fun Run, which I thought was a great idea. It was heaps of fun, with a good turn out of runners, most in Halloween dress up. They ran or walked the club’s River Run course of 2.5km or 5km, with the best dressed prize going to Mr and Mrs Potatohead! I sold truffles at the event and felt good about how it had gone. I also set up a givealittle page, which a few amazingly generous friends and family donated to. I did find it a bit tough fundraising to be honest. I’m not a very forward person and asking for donations felt a little awkward, but when I told people about the Old Ghost Road and the trust I was fundraising for, I knew I was doing a great thing for a great cause. Race week came. It was a busy one, with my son turning 10 and my eldest daughter turning 12. My two youngest children participated in the Weetbix Tryathlon and did such a good job! Although Nicki couldn’t run the race, she decided to come down south with me and be my Chief Supporter which was super cool, so on Thursday we flew to Nelson and stayed with a friend. On Friday we drove our little rental car to Westport and went straight to OGU headquarters for race pack pick up and gear check. It was a relief to learn that due to good weather we didn’t need to carry our waterproof pants and thermal longs. This was fabulous news as only a few days earlier, Cyclone Gita had thrown herself at the West Coast of the South Island. It was also a relief to learn that the track was in good condition and had come through the cyclone unscathed. Once we settled into our B&B, we headed to Johnny’s Restaurant for dinner with 20 or so other “Squadrunners”. It was neat to meet runners who I had been following on Strava or Facebook and talk about our hopes for the day ahead. After dinner we all wandered back to HQ for the briefing where race director Phil had fun telling us how much climbing we would be doing! Race Day started with a 3.00am alarm. I had prepared everything the night before, so all I had to do was get my gear on and eat. Nicki dropped me off for the 4.20am bus with enough time to grab a coffee. The bus ride to the start was about an hour long and I happened to sit with Karen Rowan, who I had met once before when a group of us ran Lake Waikaremoana last year. We chatted, along with Pete Barton (the other competition winner) and Matt Duguid. The bus chatter signaled a growing excitement among the runners. The usual pre-race port-a-loo line up was followed by registration and a chat with Kerry (from Squadrun), who told me that he wanted me to go on stage in the morning at the prizegiving regarding the fundraising I’d been doing! I told him I wasn’t too keen on speaking and he reassured me that I’d just have to stand there and he’d do all the talking. Then we were off! Our headlamps were needed for the first hour, so we didn’t see much except the track and the runners feet in front of us. It was actually a great time of the morning to be running and I tried to make sure I stuck with Karen as she seemed to be doing a great pace. We reached the first aid station, Specimen Point, in under 2 hours which was well within the cut off. From there it was more flattish trail until around the 30km mark when we started our first climb of the day. I was feeling good, we were doing a sweet pace – one I felt I could sustain. Coming into the second aid station at 42km meant we were half way, with the hard half still to come. It had taken 5.5 hours to reach Stern Valley, again well within cut off. This is where the drop bags were, and I took the opportunity to change into a dry top and bra, and re-tape my chaffing spots! I topped up my soft flasks with water and tailwind and enjoyed a big peach that I had put in my drop bag. It was so good! Karen changed shoes, and we were about to head off when a helicopter arrived. We thought it might be Ali and Maree (from Squadrun) who were going to be tail end charlies. It wasthem, and Lucy Bartholemew, who had come to run the second half of the course as a training run. We gave Ali and Maree hugs, then I told Karen I wanted a photo with Lucy. I think she is such a lovely and positive woman and a great role model, especially for young girls. I thought my daughter would get a buzz out of seeing a photo of me and her! Lucy happily obliged and we set off again. Lucy ran with us and chatted for about 5 minutes before she carried on ahead to do the same with other runners no doubt. Such a cool thing for her to do! 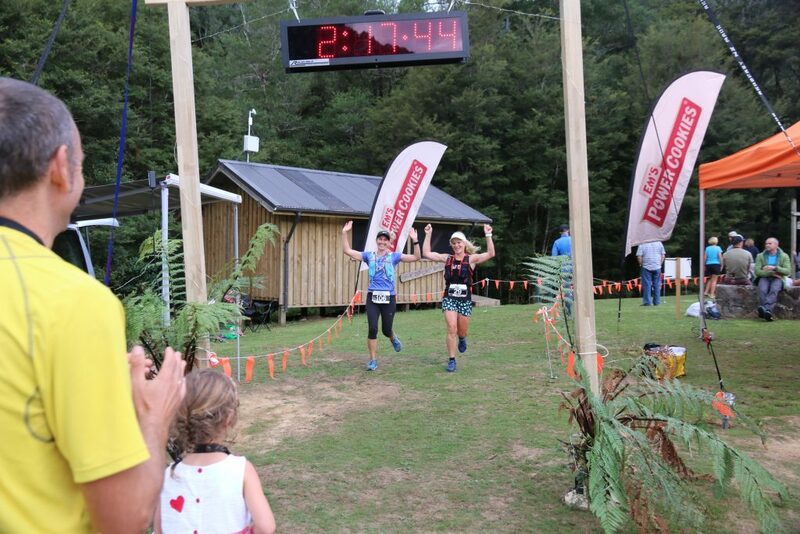 She had decided not to race due to her massive efforts at Tarawera Ultra 60km (1st woman, 3rd overall) and the Shotover Moonlight Marathon (1st woman) in the two weeks prior. It was 13km or so until the next aid station at Ghost Lake Hut, but it involved a lot of climbing. This section is where you get the amazing views along the Skyline Ridge, climb a lot of stairs and really get to marvel at the effort that has gone into building this track. I could see where my funds were going which was choice. Ghost Lake aid station at 55km was great with more extremely helpful volunteers and whitebait fritters! I hoped it wasn’t going to disagree with me as I tucked into one (it was fine, thankfully!). We knew we still had a bit more climbing to do from there, but then it leveled out again and it was just about putting one foot in front of the other. 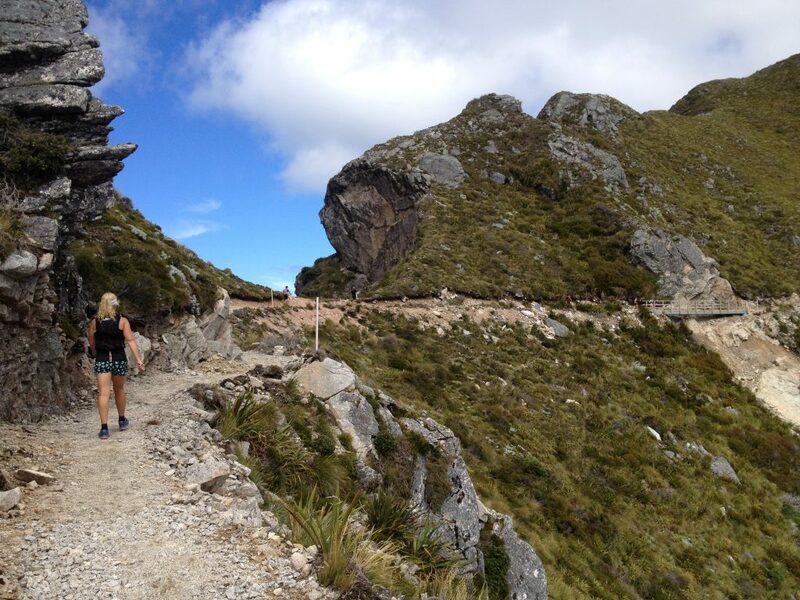 Around 65km’s in we saw Nicki who had come up from the end on her bike. She plodded along with us for a bit, then biked along for a bit and took a couple of photos. The finish line seemed so close, yet so far away! The last 12km finally felt like the downhill we had been waiting for, although very gradual. It still felt like an effort, but I knew that if i stopped it would be hard to start again. Karen and I finished together in 12 hours 17 minutes. She wanted to do cartwheels over the finish line. I agreed, but when we got there I was worried we were going to kick each other in the face if we did them at the same time so we did them one after the other. Cool way to finish an epic event! We slowly made our way down to the river to soak our aching bodies in the icy cold water. It was so so cold, I couldn’t bear to go all the way under like Karen and Nicki did! But it was so nice on the legs. The next morning at prizegiving, I was kind of expecting to be called up to stand next to Kerry, but what actually happened is Phil asked 3 of us who had done fundraising to come up and talk about our story! I have never spoken to a crowd like that before and I think it was more scary than running 85km! I managed to get some words out without fainting and I truly meant it when I said that the track is an incredible feat of craftsmanship and the money raised is going to a fantastic group of volunteers. Thank you to Squadrun, the team at Old Ghost Ultra and all who got behind me and the cause. I feel privileged to have had this amazing opportunity. This entry was tagged fundraising, Mokihinui trust, old ghost ultra. Bookmark the permalink.